**Note: This method is that in which you will be cutting your antenna to ensure a resonant length. Introduction: Common models of SWR (standing wave ratio) meters are used to give a general reference of how well an antenna is matched to a transmitter. It also has a very simple un-tuned field strength meter that utilizes a diode detector feeding the meter. It’s very insensitive. So, you’ve put your radio into where you think it will live for a bit, you’ve got your antenna connected and have mounted it somewhere that may even have a decent ground plane. Everything is connected and ready to go, right? Wrong. It’s vital that you tune your antenna before using radio. If you’re not familiar with SWR or the necessity of adjusting you antenna to get a good reading, let us give you fair warning: improper tuning of your antenna has the potential to cause much worse than a weak broadcast signal…. it can end the life of your radio before you can enjoy it. This article will walk you through the process of properly tuning your antenna (a.k.a., adjusting the SWR). It’s not a terribly difficult process, as long as you can follow directions and are patient enough for a little trial-and-error. Assuming that everything else in your system is properly installed, the only additional equipment necessary is a short length of coaxial cable (known as a jumper lead), an SWR meter, and something on which to record your readings. The antenna matching unit, or antenna tuning unit, is designed to match a non 50 Ohm antenna to a 50 Ohm transmitter. 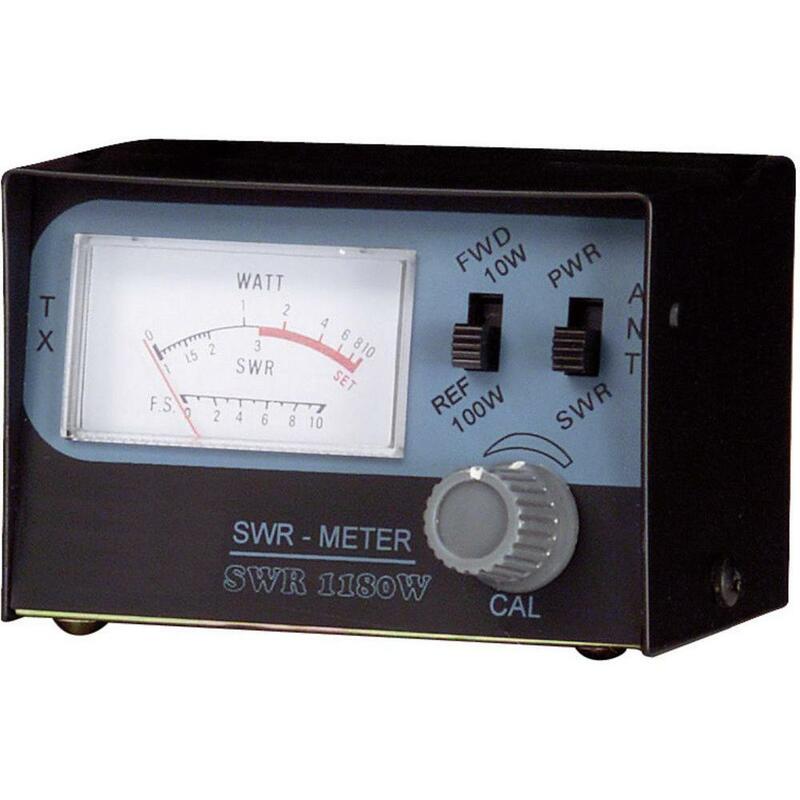 When used, the SWR meter is connected between the transmitter and the matching unit and provides an indication of the SWR as the ATU/matching unit is tuned to the correct settings. Depending upon the design of the ATU/matching unit, it will either bring antenna into resonance or will just make the antenna look like it is the correct impedance without improving its resonance. We will not be using an antenna matching unit. This is instruction for those without an antenna matching unit. An antenna matching unit may also be referred to as an “Antenna Tuner”. Equipment needed: Transceiver (UHF, VHF, HF or CB radio), Antenna, Antenna coax, SWR meter, short jumper coax ~3 foot. Procedure: The SWR meter needs to be placed in line between the antenna and the transceiver. Connect the antenna (normally connected to the back of the radio) to the connector marked “Antenna” or “Ant” on your SWR Meter. Connect one end of the short jumper coax to the “transmit” or “Xmit” on the SWR meter. Connect the other end of your jumper coax to the transceiver. Assuming you have a standard SWR meter the switches should read as follows: REF or SWR, FWD, and there should be a slide switch, or dial, marked “set”, “Cal”, “Calibrate” or “Adjust”. If different, be sure to consult your SWR meter’s owner’s manual. Take a reading of the SWR on the meter. You are now going to repeat this process for additional frequencies. Follow steps 4 through 9. The SWR reading shows the match of the antenna compared to 50 Ohms (The radio antenna input is normally 50 Ohms). If SWR on the frequency tested is below 2.0, your radio can be operated safely. If SWR on the lowest frequency is higher than it is on the highest channel, your antenna system appears to be electrically short. Your antenna length may need to be increased. If the SWR on the highest frequency is greater than that on the lowest, your antenna is considered to be “LONG” and reduction of physical height and/or conductor length will correct this situation.  If the SWR on 14.280 Mhz is higher than that on 14.100 Mhz, your antenna is too long.  If the SWR on 14.100 Mhz is higher than that on 14.280 Mhz, your antenna is too short. If your antenna is too long, it is necessary to reduce its physical length. There are several methods for shortening an antenna which vary by manufacturer. Consult your owner’s manual for detailed instructions on how to shorten your antenna. While many antennas feature a “tunable tip” that uses a small screw, some antennas may need to be cut to be shortened. Do so in 1/4″ increments and then get new readings to determine your progress. If your antenna is too short, it is necessary to increase its physical length. Most instances where the antenna length is too short are caused by a lack of ground plane. In modern antennas, there’s usually a method for adding length built in to the antenna. Other options, such as adding a spring, are also legitimate. Dual antenna installations: If you’re tuning dual antennas, you’ll want to adjust both antennas the same amount each time. As a starting point, it’s best to put the tuning screw either all the way in or out, so each antenna is the same length. Then, based on your SWR readings, length or shorten BOTH antennas the same amount each time. Re-measure SWR and continue to re-adjust as with a single antenna, making sure to make incremental changes that are as close as possible to both antennas. Readings on both channels that are less than 2.0 mean that your radio is safe to operate, but transmission may not be optimal. If readings on these channels are in the red zone on your SWR meter or above 3.0, do not attempt to use your radio. This problem must be remedied before attempting to use your radio. Troubleshooting: Let’s review the most common problems that cause your SWR meter to register danger on all channels: poor grounds, a short in the coaxial connectors, or an improperly installed mounting stud. Vehicle installations: A large percentage of high SWR readings are caused by ground plane problems. It’s a good idea to run ground straps from the body of your vehicle to the frame, doors, and trunk. Running the shortest possible ground strap from the antenna to the chassis or your vehicle is generally a good solution for ground plane problems. Simply put, grounding everything that can be ground together will improve ground plane. Vehicle installations: It is essential that your mount is properly grounded. Most improperly grounded mounts are connected to places on your vehicle that themselves are not thoroughly grounded. Any part of your vehicle that has a plastic or nylon bushing separating it from the chassis is probably not grounded. Also, chassis paint can often prevent a mount from being properly grounded. You can check the grounding of suspect parts with a voltage meter. A short in the coaxial connectors may also be the culprit behind abnormally high SWR readings. Issues with the coaxial cables are often identifiable by eye, such as severe bends or pinches. You should know that it’s essential to use 50-ohm coax for single antennas and 75-ohm for dual. When all else fails, sometimes it’s necessary to replace the coax cable because there’s a failure inside the line. By following the steps outlined in this article, you should be able to successfully tune your antenna for optimal performance and transmission.